Chittagong Division, officially known as Chattogram Division, is geographically the largest of the eight administrative divisions of Bangladesh. It covers the south-easternmost areas of the country, with a total area of 33,771.18 km2 (13,039.13 sq mi) and a population at the 2011 census of 28,423,019. The administrative division includes mainland Chittagong District, neighbouring districts and the Chittagong Hill Tracts. Chittagong Division is home to Cox's Bazar, the longest natural sea beach in the world. ; as well as St. Martin's Island, Bangladesh's sole coral reef. 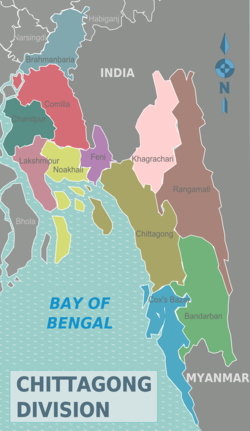 Chittagong Division is subdivided into eleven districts (zilas) and thence into 99 sub-districts (upazilas). The first six districts listed below comprise the north-western portion (37.6%) of the division, while the remaining five comprise the south-eastern portion (62.4%), the two portions being separated by the lower (or Bangladeshi) stretch of the Feni River; the upland districts of Khagrachhari, Rangamati and Bandarban together comprise that area previously known as the Chittagong Hill Tracts. Before 1995, the four districts of Sylhet Division were also a part of Chittagong Division. ^ Sajahan Miah (2012). "Chittagong Division". In Sirajul Islam and Ahmed A. Jamal (ed.). Banglapedia: National Encyclopedia of Bangladesh (Second ed.). Asiatic Society of Bangladesh. ^ Ethirajan, Anbarasan (26 December 2012). "Bangladesh's Cox's Bazar: A paradise being lost?". BBC World. Retrieved 29 January 2015. ^ Panday, V.C., ed. (2004). Environment, Security and Tourism Development in South Asia: Tourism development in South Asia. Environment, Security and Tourism Development in South Asia. 3. New Delhi: Gyan Publishing House. pp. 100–101. ISBN 978-81-8205-139-3. ^ The Europa World Year Book 2003. Taylor & Francis. 2003. p. 679. ISBN 978-1-85743-227-5. Wikivoyage has a travel guide for Chittagong Division.